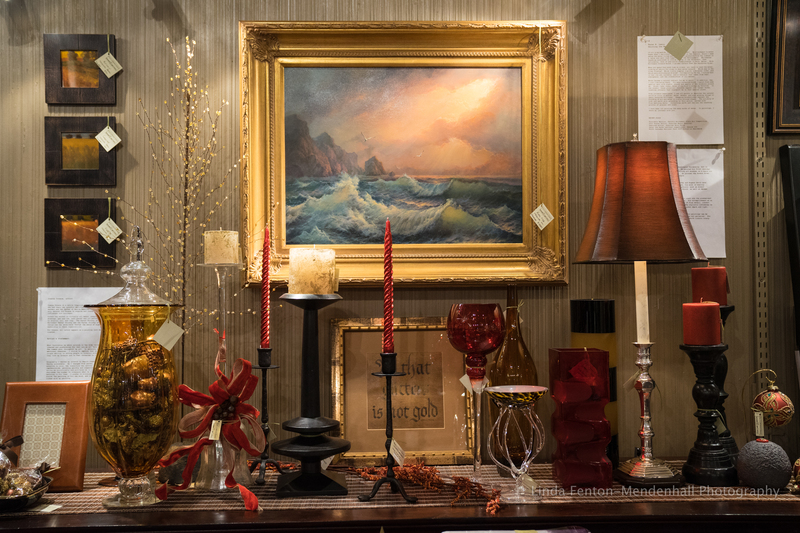 Seek, Fariweather’s December art exhibition, featured table scapes. 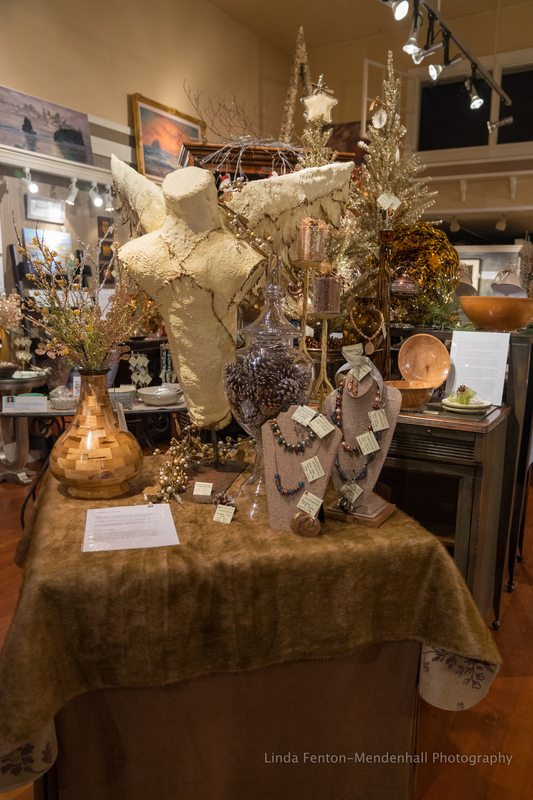 Encaustic angel by Gregory Bell, wood bowls by Daniel Harris, wood vase by Mike Brown and jewelry by Renee Hafeman. 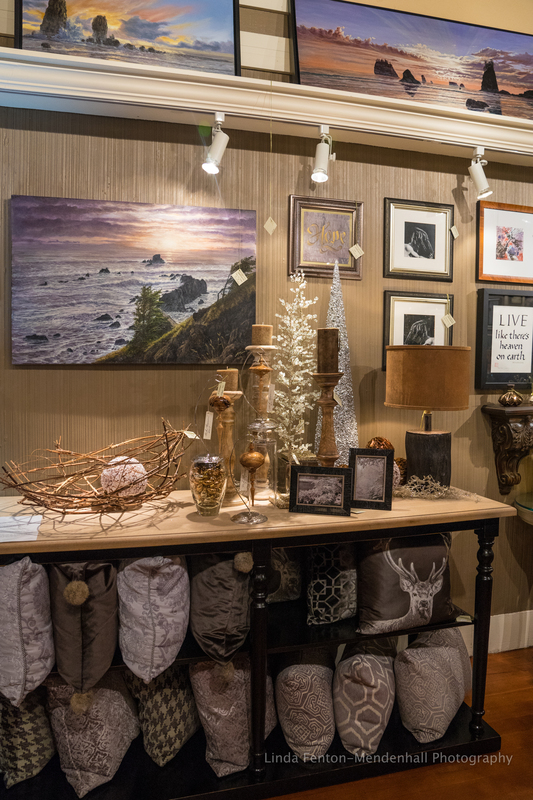 “When you Search for Me” oil painting by Lee Munsell, calligraphy by Penelope Culbertson, basket by Charles Schweigert and burl ornaments by Mike Brown. “Winter’s Ocean” oil painting, by Ron Nicolaides, oil pastels by Joanne Donaca and calligraphy by Penelope Culbertson. 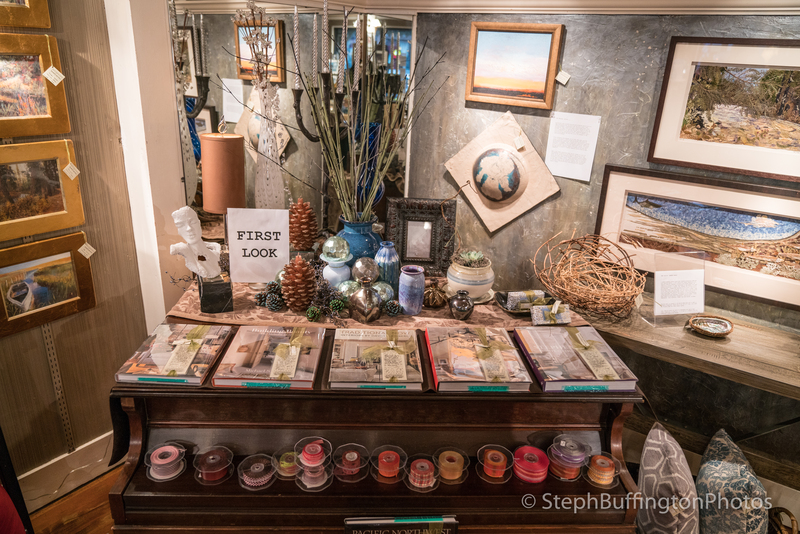 Handmade boxes and books by Christine Trexel, encaustic landscape by Kimberly Kent and bracelets by Mary Boitta. 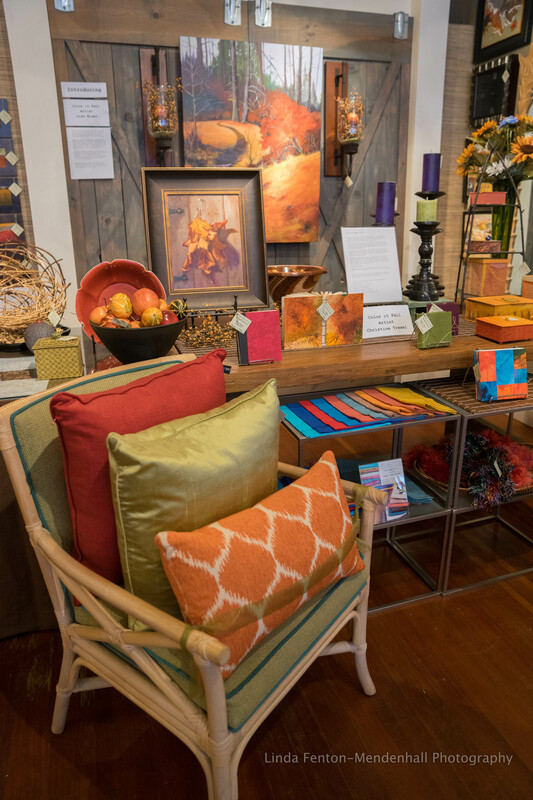 “I’m always enthralled when entering Fairweather House and Gallery! A feeling of peace and serenity fill my senses. 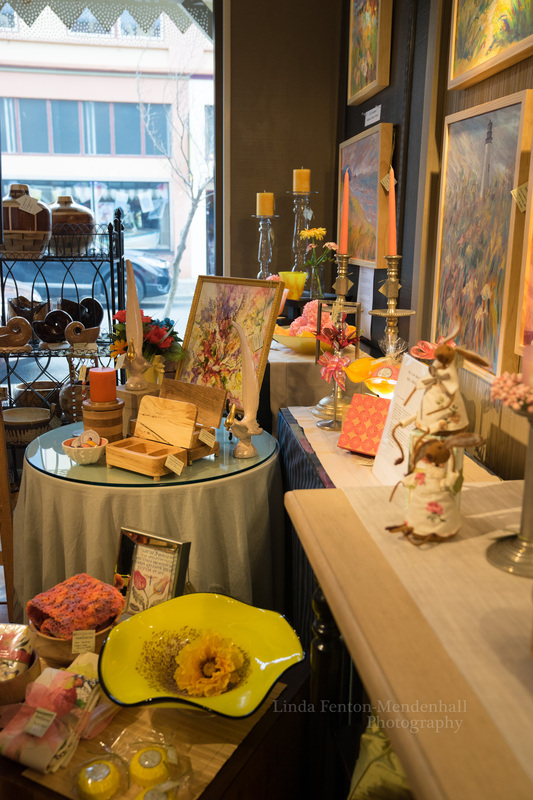 The beautiful books, vases, natural decor and fabrics complement amazing artworks of every medium. 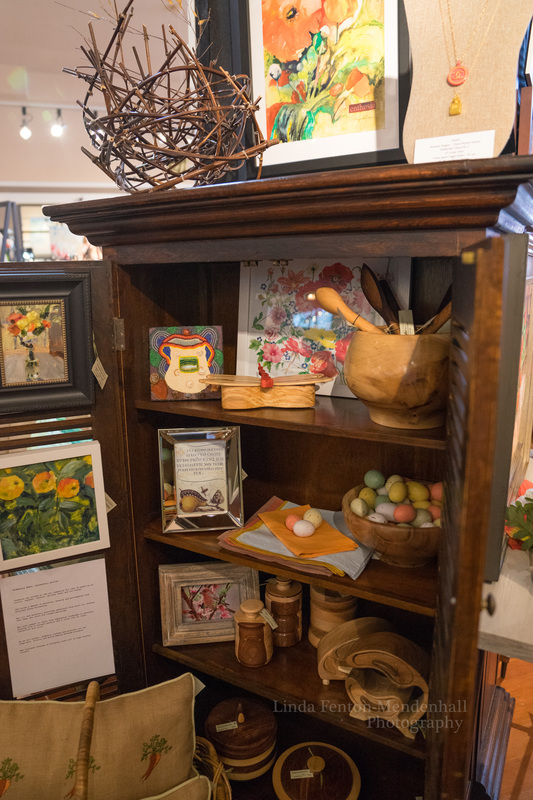 Oils, watercolors, mixed media, wood carvings, photographs and jewelry are displayed in unique exhibit centers that meld peacefully one to another. The gallerist is an artist when it comes to decorating and showcasing beautiful objects and art!” –K. R.
Meticulous displays, like none other, with disciplined attention to design perspectives. 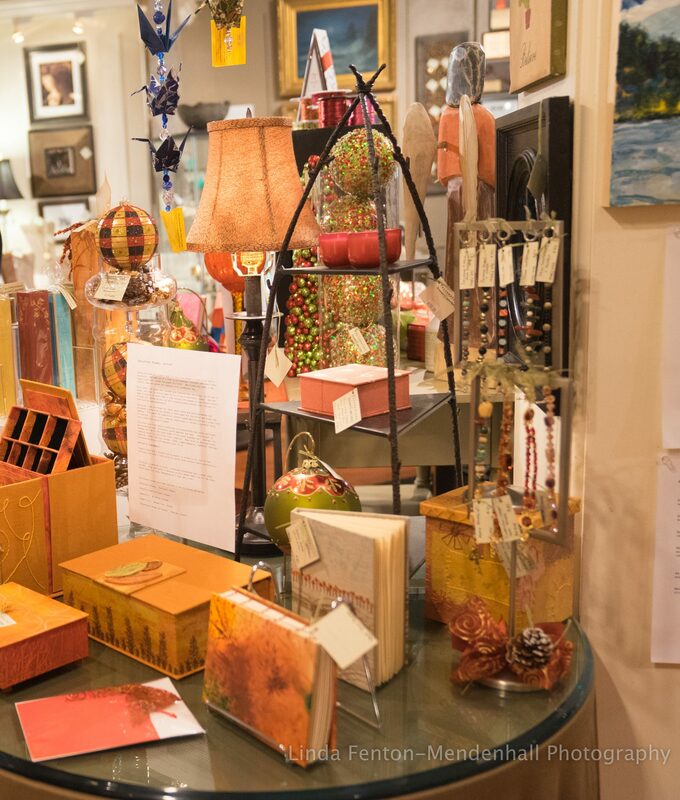 Find harmony in exquisite materials, combined with the spirit of many artists who know how to apply the mark of being in the Northwest. Color it Fall. Artist lecture notes by Jo Pomeroy-Crockett. 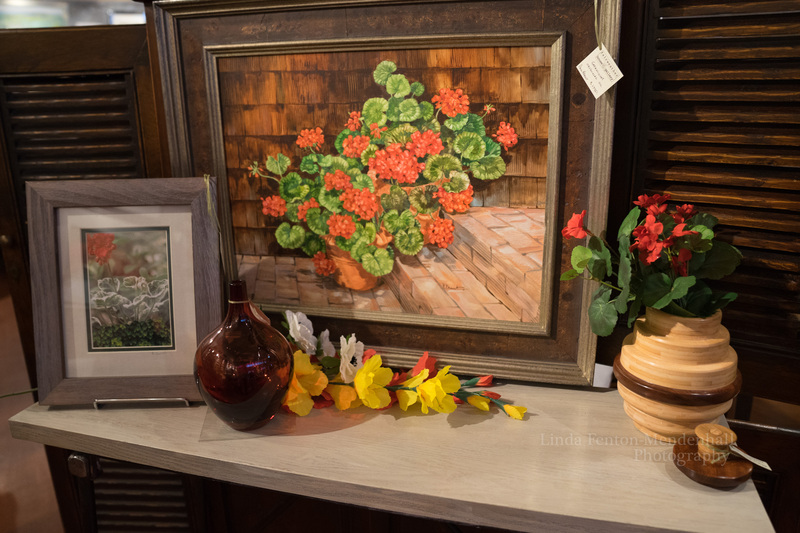 Bamboo basket by Charles Schweigert, pastels by Joanne Donaca, autumn original oil by Savvy Dani, landscape plein air original by Lisa Wiser, abstracts by Renee Rowe, shell oils by Paul Brent, paper textiles by Christine Trexel, photography by Linda Fenton-Mendenhall. 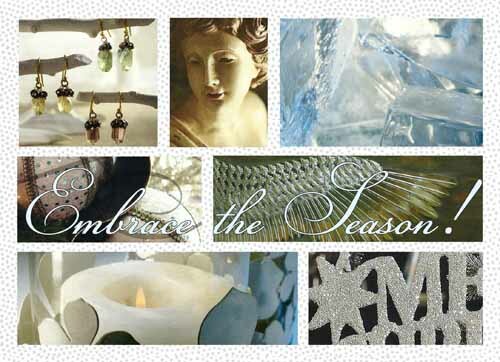 Design by Denise Fairweather, allied member, A. S. I. D., American Society of Interior Designers. 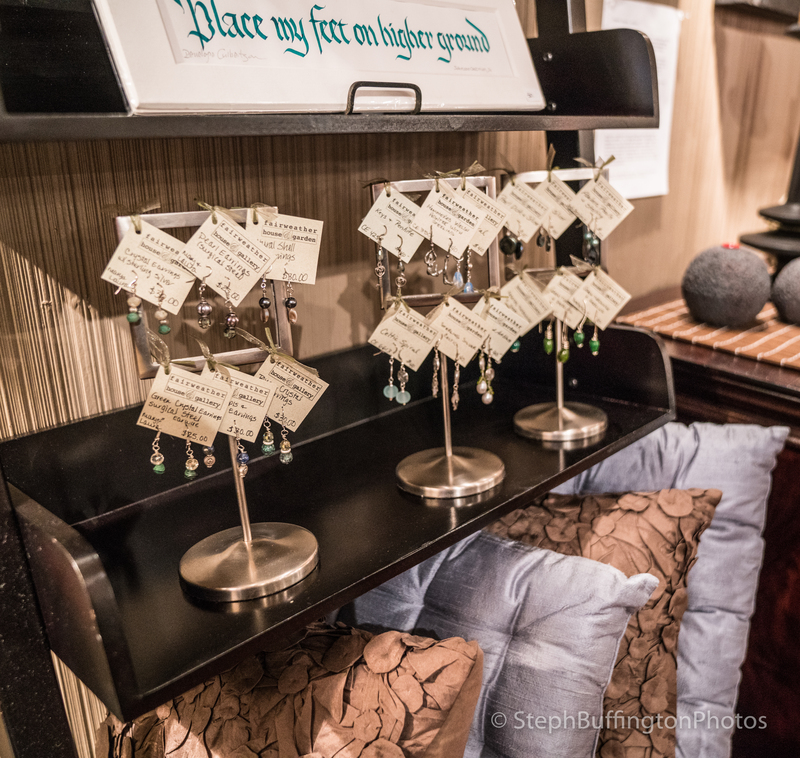 Featured art on display by Jo Pomeroy-Crockett and calligraphy by Penelope Culbertson. We see color thanks to the cones in our eyes. (The rods are for night vision.) Humans are trichromats, that is, we see red, green, and blue. . . and mixtures of all these. Many birds and fish, on the other hand, are tetrochromats and see 4 colors including ultraviolet colors invisible to us. A small percentage of women, some 2% – 3%, are tetrachromats and see at least one additional ultraviolet color. Ask a few people around the room. Chances are, between 50 – 60% will favor blue. What can color do? It can . . .
* attract attention. People see color before they see anything else. * hold attention. People pay attention to black and white for about ½ second or less. They pay attention to color for 2 – 3 seconds. * Color has power. Consider the colors of STOP, GO and CAUTION. *Color images are processed before black and white images, so they are remembered better. *Color informs better than black and white. Research shows color improves readership by 40%, learning by 55 – 78%, and comprehension by 73%. *Colors have personality and meaning and personalities vary with one’s culture. *Color combined with shape sends special messages. *Color attracts attention to brands better than words. What colors are signs? What is on the background of a sign? *The color of your clothing tells a lot about you, your profession, and your status. *Color transmits messages without ever using a word. Aren’t artists lucky? We have free use of color which can to do and say so many different things! All we have to do is to learn to make use of the many meanings of color as we create our treasures. —Jo Pomeroy- Crockett, Ph.D, writer and artist. 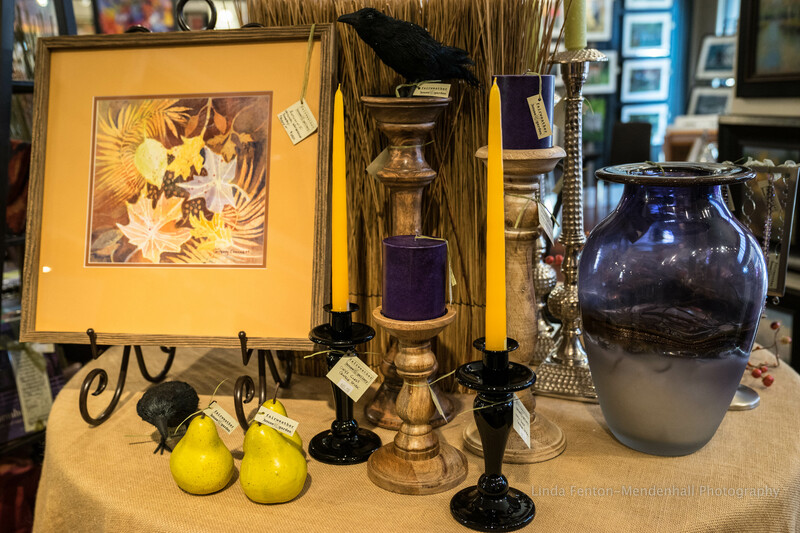 COLOR IT FALL, table display featuring art by Jo Pomeroy-Crockett. Images from Rain or Shine @ Fairweather’s. April 2016. 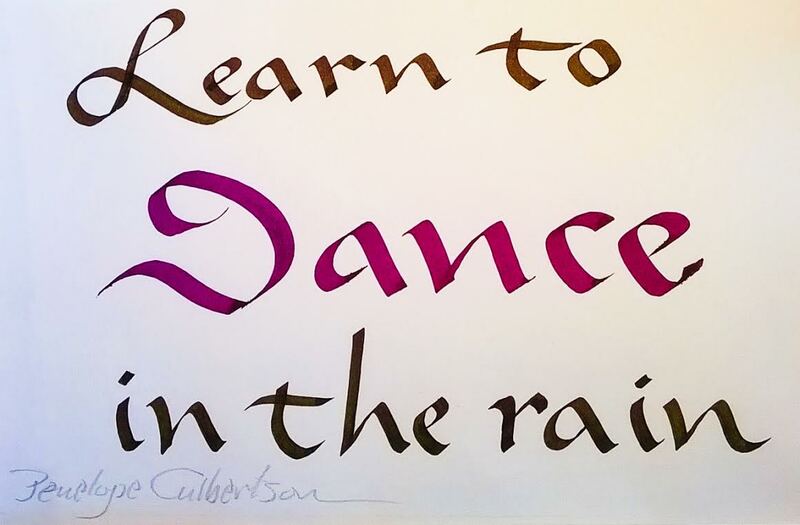 Original calligraphy by artist Penelope Culbertson. 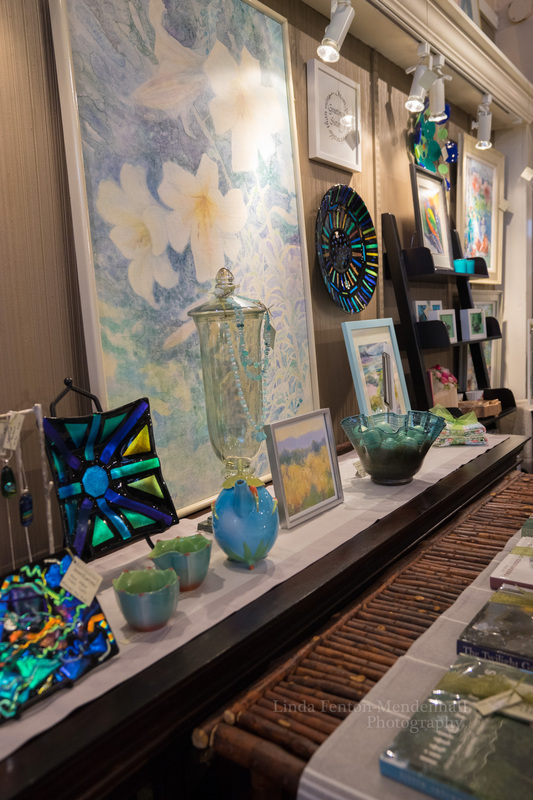 Opening reception for the exhibit Rain or Shine, juxtaposed an array of art, images and voices in a way that resonated with the spring season at the beach. 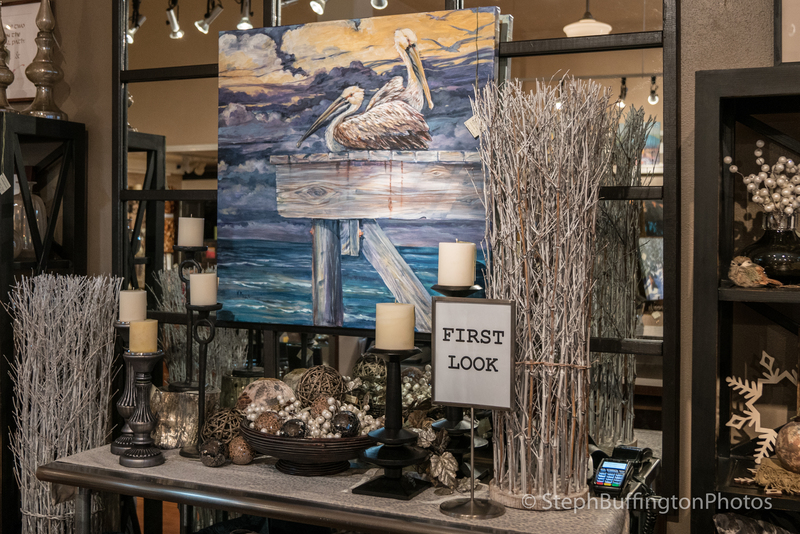 Two artists offered a Seaside Painting LIVE ™ episode, starting with a blank canvas then completing a quick finish during the April Seaside First Saturday evening at Fairweather’s. 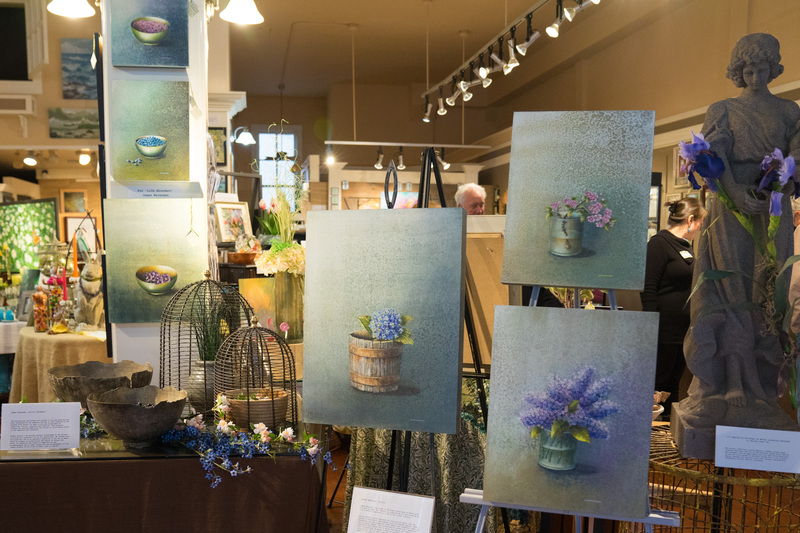 The free event offered art patrons a marvelous opportunity to watch masters create, in addition, visitors enjoyed LIVE music by Shirley 88, artists lectures, guest speakers, wine tasting and more. 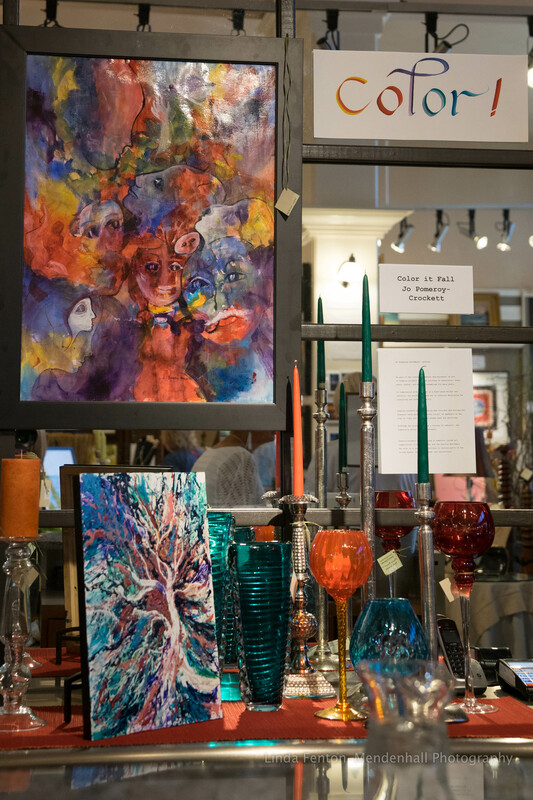 To view the art action and performance go to the links provided by Linda Fenton-Mendenhall Photography. All rights reserved. “Thank you for a delightful evening of artworks, artist presentations, gifts, music and hors d’oeuvres. We enjoyed the entire event from start to finish. Your gallery is delightful and therapeutic. We will visit again on our next trip. Thank you for wrapping the artworks safely for our travels. With much appreciation” –A. R. Joseph, Ed. D, educational consultant. Please visit http://www.fairweatherhouseandgallery.com/ artists/ Gretha Lindwood, Penelope Culbertson and Neal Maine for more information. Please visit http://www.facebook.com/SeasideFirstSaturdayArtWalk for more information about the historic Gilbert District monthly Art Walks. Art Walk hostesses posing on Broadway Bridge in downtown Seaside, OR. In the back ground is the Gilbert Block building that houses several boutiques and galleries who sponsor Seaside First Saturday Art Walk events. The Broadway Bridge spans the Necanicum River which is nearly 84 miles long. The Necanicum one of the most healthy rivers in Oregon for it has never had a dam built over it. 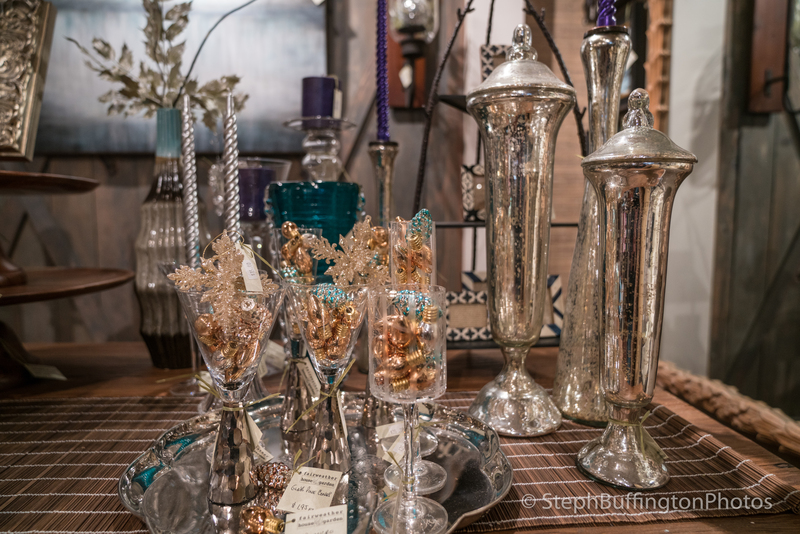 East on Broadway, over the bridge, towards Highway 101 (the Pacific Coast Highway), is the historic Gilbert District, an area that oftentimes is called “adult land” with boutiques, restaurants, fine art galleries and the famous Seaside antique mall. West on Broadway, over the bridge, towards the ocean (the other side), is an area sometimes called “fun land” for it houses an arcade, a carousel, paddle boats to rent, salt water taffy and ice cream shops, bumper cars and more, an amazing boardwalk and, for course, the fabulous Seaside beach! The Broadway Bridge, spanning the Necancium River, is nearly 84 miles long. The Necanicum one of the most healthy rivers in Oregon for it has never had a dam built over it. Seaside was the first ocean resort town in Oregon. Please visit https://wordpress.com/stats/insights/thegilbertdistrict.wordpress.com for more information about the historic Gilbert District or go to http://www.facebook.com/ the historic gilbert district for more images. For more information about the Necanicum River and good things happening in the environment go to http://www.necanicumwatershed.org. Introducing sculpture artist Charles Schweigert. These pieces are made entirely of bamboo and waxed linen, and although they suggest basket shapes they are more sculptural than functional. The bamboo is bent using heat, interwoven, and then secured using waxed linen knots. The shapes are inspired by traditional Japanese baskets, which use humble materials to suggest movement and energy associated with natural forces in the environment. They embody the Japanese wabi-sabi aesthetic by using perishable, natural materials in a way that is more suggestive than literal. The result is an elegant object with an abstract quality similar to Japanese calligraphy, which relies to a large extent on movement and energy to convey meaning. In this respect, they can be viewed as three-dimensional calligraphy. They also reflect the Japanese gardener’s use of simple materials and techniques to suggest a completely natural form. The hand of the maker disappears, and the object appears to have taken shape organically. Originally from Michigan, and after spending twenty years in the Southwest, I now reside in Astoria, Oregon, where the climate is a good compromise between the Midwest and Southwest. I have worked in a number of professions, primarily teaching and urban planning, while continuing to develop my skills in painting. With a degree in art from Kalamazoo College and graduate work at the Center for Creative Studies in Detroit, I worked for a summer as an intern at the Art Institute of Chicago in the late 60’s where I was exposed to the work of Willem deKooning, whose paintings form a significant influence on my own work. Other influences include the work of Joan Mitchell and Susan Rothenberg. I also draw inspiration from contemporary crafts, principally wood-fired ceramics and contemporary Japanese textiles and basketry. I have exhibited widely in the Southwest and Northwest since the early 1990’s, having had eleven one-person shows in Santa Fe, Portland, Denver, Seattle, and Astoria. My work is in private and corporate collections of contemporary art in the United States, Europe, Japan, and the Caribbean. 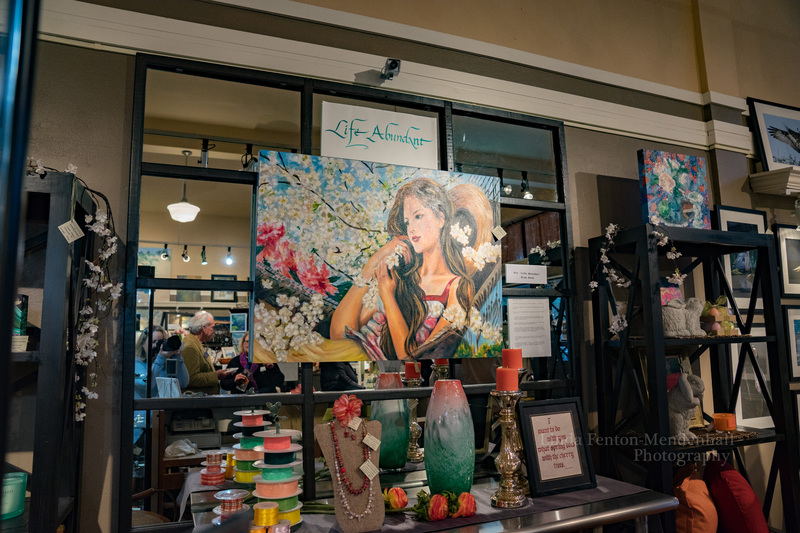 In Oregon, my paintings can be seen at the RiverSea Gallery in Astoria, White Bird Gallery in Cannon Beach, Fairweather House and Garden Gallery in Seaside, and at Gallery 903 in Portland. Outside Oregon, I exhibit in Scottsdale, Arizona, and Albuquerque, New Mexico. 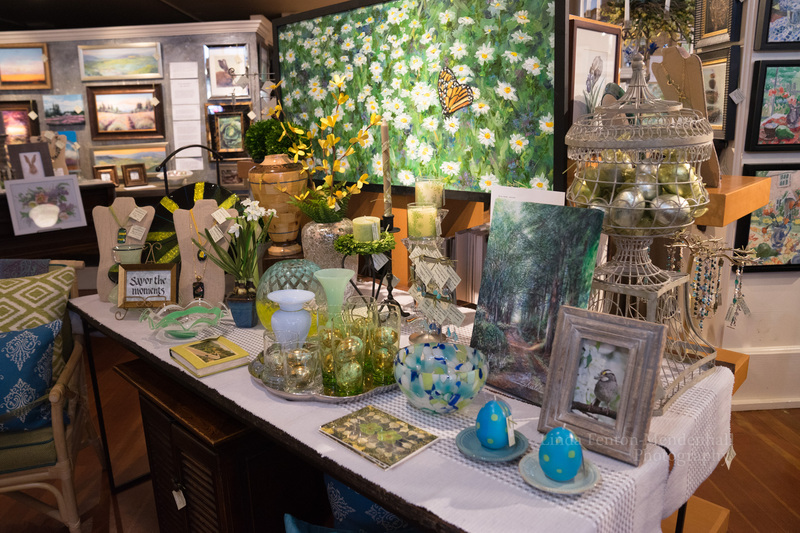 On Saturday April 2nd Charles Schweigert will meet and greet art patrons at the Fairweather House and Gallery during the Seaside First Saturday Art Walk 5-7pm. Please visit http://www.facebook.com/SeasideFirstSaturdayArtWalk for more information. Go to http://www.fairweatherhouseandgallery.com for additional information about the gallery. Please visit http://www.cjschweigert.com for more information about the artist.